They had pudgy faces, stumpy arms and small close-set eyes and were dramatically different from the traditional cute baby doll. Each was subtly different from every other one as a computer randomly placed small changes in the manufacturing process for each doll. 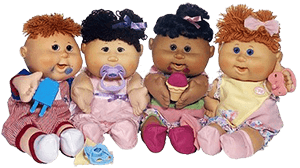 They were the Cabbage Patch Dolls and they were the most wildly successful dolls of the 1980s. Cabbage Patch Dolls were the brainchild of Xavier Roberts, a sculptor living in Georgia. Roberts showcased the dolls in his art exhibit, dressing his assistants in maternity ward clothing and holding the dolls up for adoption. Instead of selling them, he allowed people to adopt them, passing on “official” birth certificates and adoption papers. Roberts marketing gimmick worked brilliantly as sales exploded across the United States. In many parts of the country they were such a hot Christmas commodity that fistfights broke out between potential customers, stores had to hold lotteries to determine eligible purchasers and police were called to help quell near riots. Sales grew dramatically from $60 million in their first year to more than $600 million in 1985 and other companies tried to profit off of their success by creating facsimiles of the dolls. The dolls were unable to sustain the long term popularity enjoyed by some other dolls through the years but in a short period of time became the biggest fad of the 1980s.